Does Your Podcast Have A Format? 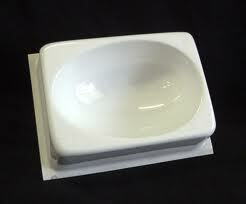 A format to me is like one of those plastic Easter egg moulds. You’ve got the shape of the egg and the pattern in the mould. All you do is pour in the chocolate and you’ve got your egg. From here you can change the color of the chocolate, add some delicious syrup in the middle, heck you can even put a toy in there, but the basic structure of the egg still looks the same. A podcast format works in the same way, it gives your podcast structure. The only thing that regularly changes is the content that you add to that structure. One way to decide the format of your podcast is to be aware of all the things (or bits) that make up your podcast. A quick way to do this is by asking some questions. Will this be a music podcast? Or talk based podcast? If my podcast does include music, how much music will I play? Will I be hosting this podcast myself or will I have a co-host? Will I do an interview every episode? How long will my episode be? Will I have recurring segments that I will do every week? Answering these questions will help got a clear picture of the ‘bits’ that’ll make up your podcast, and once you’ve figured out what they are, it’s time to format the show! 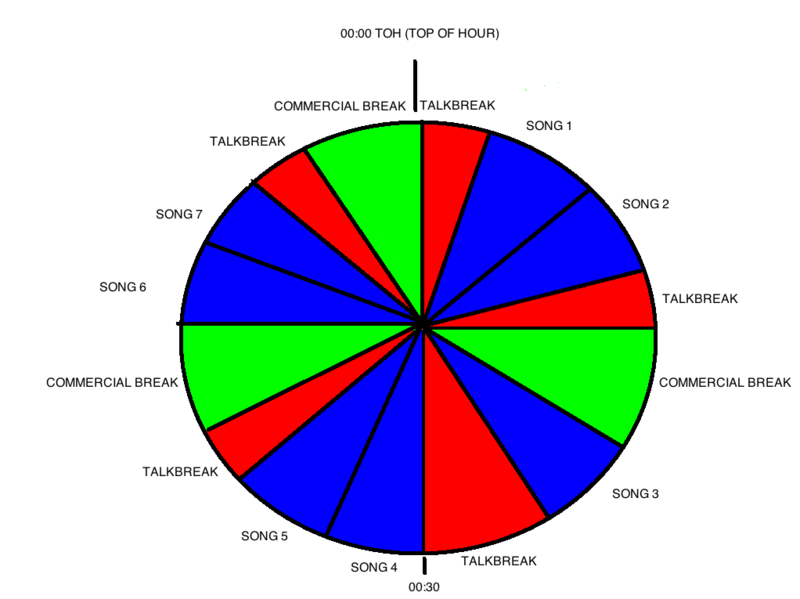 As you can see from the clock above, this Radio station plays 7 songs an hour (the blue wedges), has scheduled 3 commercial breaks an hour (the green wedges) and allows the DJ to speak 5 times throughout the hour (the red wedges). 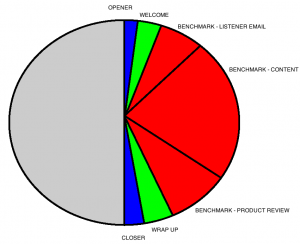 Now, even though you’re not going to be playing 15 minutes of commercials in your podcast, you might want to consider drawing up a clock to be clear on the structure of your episodes. I’ve included an example of a podcast clock below. This clock represents a half hour talk based podcast (please click on the clock to get a closer look). The blue wedges on this clock represent the production pieces you might play, such as a show opener and closer. 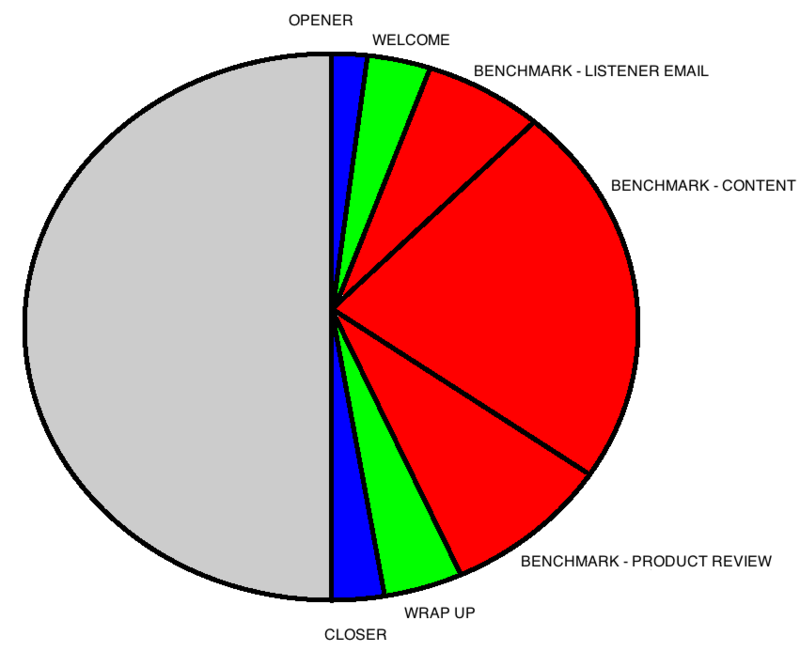 The green wedge represents your opening and closing remarks, while the red wedges represent the bulk of your spoken content. So if this was your podcast format, this is how you would approach the recording of each show. Remember, the format would be the same only the content changes. 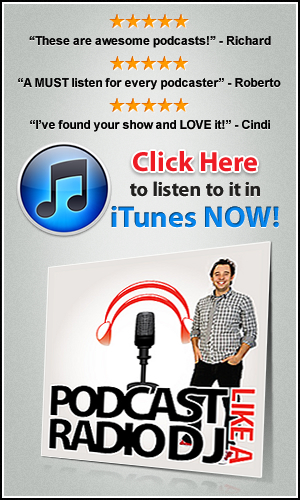 Deciding upon a format is a great way to take your podcast to the next level. After all Radio stations have invested millions to find out what listeners like and don’t like. And lucky for you I can tell you that they like familiarity and a sense of structure, and a format is the easiest way to give it to them.